There are some people who purposely wait until Christmas Eve to do all their shopping. They wear their procrastination as a badge of honor. On The other end of the scale, there are folks who relish getting everything done long before the first piece of tinsel goes on to the Christmas tree. Perhaps the best approach to getting ready for the holidays is to fall somewhere in between the two. It never hurts to do as much as you can before things get hectic. That’s why a junk removal session with Junk King Monterey in the coming weeks is a good way to make sure your home will be junk free for the holidays. In the last couple of months, how many times have you looked at something in your home and thought, “I wish I could get rid of that.” If you have to think that thought then obviously there are some complications with regard to having that object taken from your home. It could be that it’s too heavy or bulky for you to move on your own. Plus you might need a truck to take it to its final resting place. That’s exactly what you’ll be provided by with Junk King. There to send over a pair of movers. This will be your private workforce that you can direct to pick up just about anything in your home to load onto the truck. It’s how they pack stuff onto the truck that will determine your final price. This is not something that is presented at the end of the job. 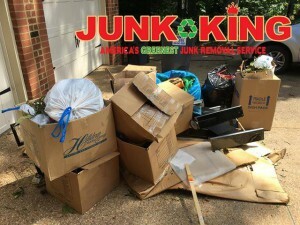 Instead, the junk King crew will look over all the stuff you want to get rid of and know right away how much space it will take on the back of the truck. It will either be one third, one-half, one quarter or the whole truck. That will be your price. This is a flat fee that covers everything. Even if the crew has to take a little extra time to dismantle something you want to get rid of you won’t be charge for that additional labor. The best approach to getting a junk free home for the holidays is a session with Junk King Monterey. Make it happen today! This entry was posted in Monterey Junk Removal and tagged clutter, holidays, Junk King, Junk Removal on October 31, 2017 by Junk King. Last updated November 1, 2017 .